The Discourse on the Method is one of the most influential works in the history of modern philosophy, and important to the development of natural sciences. In this work, Descartes tackles the problem of skepticism, which had previously been studied by Sextus Empiricus, Al-Ghazali and Michel de Montaigne. Descartes modified it to account for a truth he found to be incontrovertible. Descartes started his line of reasoning by doubting everything, so as to assess the world from a fresh perspective, clear of any preconceived notions. The book was originally published in Leiden in the Netherlands. Later, it was translated into Latin and published in 1656 in Amsterdam. The book was intended as an introduction to three works Dioptrique, Météores and Géométrie. 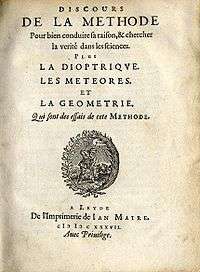 La Géométrie contains Descartes' first introduction of the Cartesian coordinate system. That the text was written and published in French rather than Latin, which was the language in which philosophical and scientific texts were most frequently written and published (as were most of Descartes' other works), is worth noting. Together with Meditations on First Philosophy (Meditationes de Prima Philosophia), Principles of Philosophy (Principia philosophiae) and Rules for the Direction of the Mind (Regulae ad directionem ingenii), it forms the base of the epistemology known as Cartesianism. Descartes describes his disappointment with his education: as soon as I had finished the entire course of study... I found myself involved in so many doubts and errors, that I was convinced I had advanced no farther... than the discovery at every turn of my own ignorance.. He notes his special delight with mathematics, and contrasts its strong foundations to the disquisitions of the ancient moralists [which are] towering and magnificent palaces with no better foundation than sand and mud. ".... the reading of good books is like a conversation with the best men of past centuries"
Descartes was in Germany, attracted thither by the wars in that country, and describes his intent by a "building metaphor". He observes that buildings, cities or nations that have been planned by a single hand are more elegant and commodious than those that have grown organically. He resolves not to build on old foundations, or to lean upon principles which, in his youth, he had taken upon trust. "The first was never to accept anything for true which I did not clearly know to be such; that is to say, carefully to avoid precipitancy and prejudice, and to comprise nothing more in my judgment than what was presented to my mind so clearly and distinctly as to exclude all ground of doubt. Descartes uses the analogy of rebuilding a house from secure foundations, and extends the analogy to the idea of needing a temporary abode while his own house is being rebuilt. The following three maxims were adopted by Descartes so that he could effectively function in the "real world" while experimenting with his method of radical doubt. They formed a rudimentary belief system from which to act before he developed a new system based on the truths he discovered using his method. Applying the method to itself, Descartes challenges his own reasoning and reason itself. But Descartes believes three things are not susceptible to doubt and the three support each other to form a stable foundation for the method. He cannot doubt that something has to be there to do the doubting (I think, therefore I am). The method of doubt cannot doubt reason as it is based on reason itself. By reason there exists a God, and God is the guarantor that reason is not misguided. Perhaps the most strained part of the argument is the reasoned proof of the existence of God, and indeed Descartes seems to realize this as he supplies three different proofs, including what is now referred to as the ontological proof of the existence of God. He goes on to the motion of the blood in the heart and arteries, endorsing the findings of William Harvey though not by name, ascribing them to "a physician of England," but ascribing the motive power of the circulation to heat rather than muscle power. He describes that these motions seem to be totally independent of what we think, and concludes that our bodies are separate from our souls. "I remarked, moreover, with respect to experiments, that they become always more necessary the more one is advanced in knowledge; for, at the commencement, it is better to make use only of what is spontaneously presented to our senses." "First, I have essayed to find in general the principles, or first causes of all that is or can be in the world." The most important influence, however, was the first precept, which states, in Descartes words, "never to accept anything for true which I did not clearly know to be such." This method of pro-foundational skepticism is considered by some to be the start of modern philosophy. "I know how very liable we are to delusion in what relates to ourselves; and also how much the judgments of our friends are to be suspected when given in our favor." "Of philosophy I will say nothing, except that when I saw that it had been cultivated for so many ages by the most distinguished men; and that yet there is not a single matter within its sphere which is still not in dispute and nothing, therefore, which is above doubt, I did not presume to anticipate that my success would be greater in it than that of others." "...And although my speculations greatly please myself, I believe that others have theirs, which perhaps please them still more." "...In what regards manners, everyone is so full of his own wisdom, that there might be as many reformers as heads...."
"The first was to include nothing in my judgments than what presented itself to my mind so clearly and distinctly that I had no occasion to doubt it." "...I entirely abandoned the study of letters, and resolved no longer to seek any other science than the knowledge of myself, or of the great book of the world...."
"The most widely shared thing in the world is good sense, for everyone thinks he is so well provided with it that even those who are the most difficult to satisfy in everything else do not usually desire to have more good sense than they have...."
↑ Najm, Sami M. (July–October 1966). "The Place and Function of Doubt in the Philosophies of Descartes and Al-Ghazali". Philosophy East and West. Philosophy East and West, Vol. 16, No. 3/4. 16 (3–4): 133–141. doi:10.2307/1397536. JSTOR 1397536. ↑ http://oregonstate.edu/instruct/phl302/texts/hobbes/leviathan-c.html#CHAPTERXIII Archived May 28, 2010, at the Wayback Machine. ↑ "Essays of Montaigne, vol. 6 - Online Library of Liberty". libertyfund.org. ↑ Descartes, Rene (1960). Discourse on Method and Meditations. Laurence J. Lafleur (trans). New York: The Liberal Arts Press. ISBN 0-672-60278-4. ↑ Three years have now elapsed since I finished the treatise containing all these matters; and I was beginning to revise it, with the view to put it into the hands of a printer, when I learned that persons to whom I greatly defer, and whose authority over my actions is hardly less influential than is my own reason over my thoughts, had condemned a certain doctrine in physics, published a short time previously by another individual to which I will not say that I adhered, but only that, previously to their censure I had observed in it nothing which I could imagine to be prejudicial either to religion or to the state, and nothing therefore which would have prevented me from giving expression to it in writing, if reason had persuaded me of its truth; and this led me to fear lest among my own doctrines likewise some one might be found in which I had departed from the truth, notwithstanding the great care I have always taken not to accord belief to new opinions of which I had not the most certain demonstrations, and not to give expression to aught that might tend to the hurt of any one. This has been sufficient to make me alter my purpose of publishing them; for although the reasons by which I had been induced to take this resolution were very strong, yet my inclination, which has always been hostile to writing books, enabled me immediately to discover other considerations sufficient to excuse me for not undertaking the task.